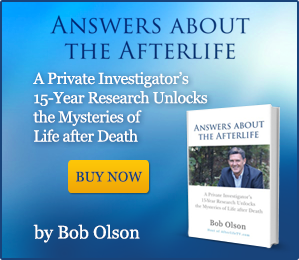 “Here’s a rare interview where world-recognized medium James Van Praagh interviews me, Bob Olson, about my 15-year investigation of the afterlife — the topic of my book, Answers About The Afterlife. Discover the evidence I found and the conclusions I drew based on my experience with mediums, spirit artists, past-life regressions, life-between-lives regressions, inspired writing, meditation, after-death communications and more, and how I integrated these experiences with my interviews of people who have had near-death experiences, out-of-body experiences, and their own after-death communications. Bob Olson is interviewed by James Van Praagh about his experiences investigating life after death and what he learned from the evidence he uncovered. 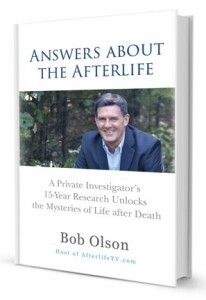 Or visit http://www.AnswersAboutTheAfterlife.com to read the first chapter of the book by signing up for the newsletter. This interview was originally aired on Hay House Radio’s “Talking To Heaven” with James Van Praagh: http://www.hayhouseradio.com/#!/show/talking-to-spirit — check out other interviews by James. 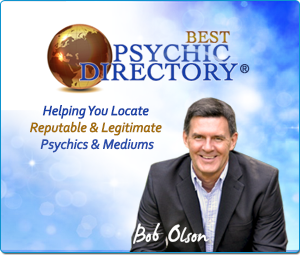 Bob Olson’s websites are linked below. 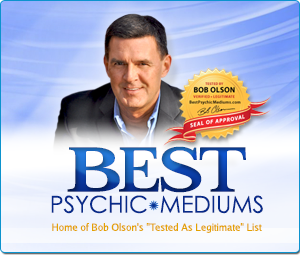 Bob is the author of Answers About The Afterlife, host of Afterlife TV, and founder of two resources for locating credible and reputable psychics and mediums: Best Psychic Directory & Best Psychic Mediums. 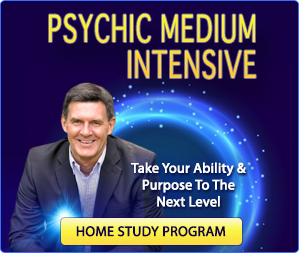 He also teaches a course for psychics and mediums based on his research called Psychic Medium Intensive at http://www.PsychicMediumWorkshop.com. James Van Praagh has been working as a medium and teaching people about life after death for over 30 years. His first book, Talking To Heaven, reached #1 on the The New York Times Bestseller list. Then he went on to write Reaching To Heaven, Healing Grief, Heaven And Earth, Ghosts Among Us, Unfinished Business, Looking Beyond (for teens) and his latest book, Growing Up In Heaven. He has also written a book on meditation. James Van Praagh had a daytime television talk show, Beyond With James Van Praagh, he produced a successful TV mini-series about his life on CBS entitled Living With The Dead starring Ted Danson (playing the role of James Van Praagh) and Mary Steenburgen, produced The Dead Will Tell on that network starring Anne Heche and Eva Longoria, and was Co-Executive Producer of the CBS primetime series Ghost Whisperer starring Jennifer Love Hewitt. You can visit James Van Praagh’s website at www.VanPraagh.com where you can sign up for his online courses, purchase autographed books, view his calendar of events, and participate in his online chat rooms. Another very enjoyable show. You are as good an interviewee as and interviewer. I always look forward to Thursdays and Afterlife TV. Thanks, as always. I appreciate you. Thank you Bob for your kindness it’s the most interesting and inspiring information anyone could ever hope for,I will get your book to fill in the gaps,regards John.UK. Thank you. I appreciate you taking the time to write me. Best wishes to you in the UK. I work as a Medium and have had Spirit tell me that someone was reincarnated, i.e., they are alive and well in a different form. 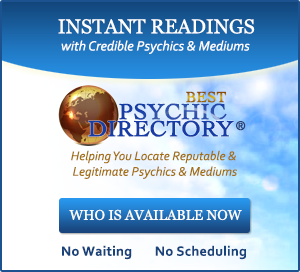 I was unable to connect to their Spirit, so I assumed I could only receive psychic information about the person now. I am happy that the question about “when” we reincarnate was asked. I’ve been doing this for about a decade and I am very excited to purchase this book and learn more. I AM ALWAYS LEARNING! The path with Spirit is always full of learning….THANK YOU! Well I certainly love when mediums have enough awareness to know there is always more to learn. I’m happy you enjoyed this interview. Thanks for writing. Very enlightening and stimulating Q&A with James Van Praagh and the background photographs were beautiful. Looking forward to reading your next book on the afterlife Bob. You’re very kind to write. Thank you. Always nice to hear from you. Thank you! I’ll let Melissa know you liked the photos. Thanks for writing. LOVE this interview! I have listened to many and this dynamic duo never disappoints. Thank you Bob, Melissa and James for all you do to help all of us understand the afterlife! I really enjoyed your interview. How wonderful that your father comes through to you from spirit.. Thanks for sharing.